This is the first book to focus on the broader structural changes which took place in the financial industry over the full period of decline from the Stock Market Crash in 1929 to the end of President Franklin D. Roosevelt's One Hundred Days in 1933. The basis for many of Wigmore's comments is an analysis of 142 leading companies whose stocks constituted approximately 77 percent of the market value of all New York Stock Exchange stocks. Wigmore also examines the various bond markets and relates the money market to the bond market, monetary policy, business conditions, and the problems of the banking system. 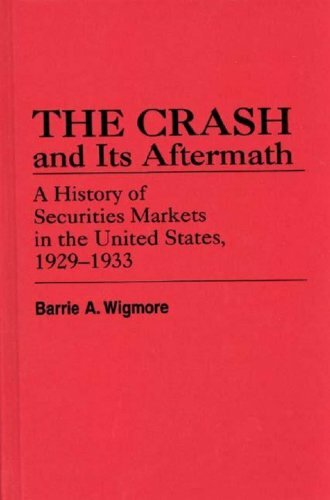 Treating each year from 1929 to 1933 separately, Wigmore shows the interrelation between the stock, bond, and money markets and events in politics, the economy, international trade and finance, and monetary policy. The Statistical Appendix of 41 tables consolidates financial statistics which have hitherto been widely dispersed, permitting in-depth study. If you have any questions about this product by Barrie A Wigmore, contact us by completing and submitting the form below. If you are looking for a specif part number, please include it with your message.